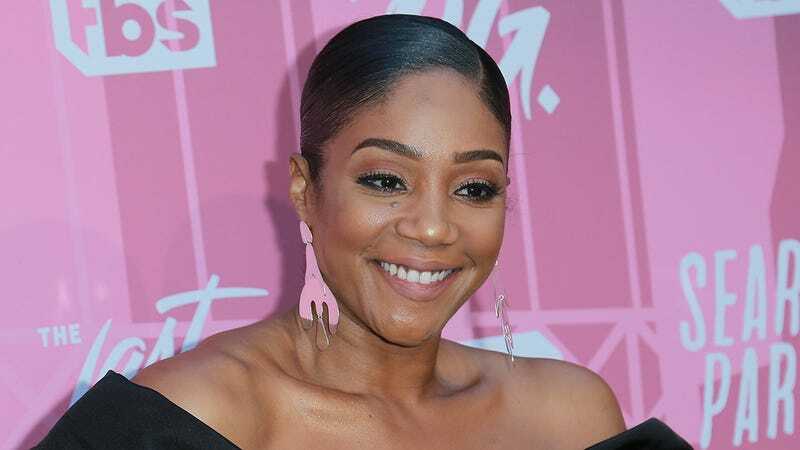 Tiffany Haddish might just be this year’s biggest breakout star. Between her scene-stealing performance in ‘Girls Trip,’ her hilarious presentation with Maya Rudolph at the Academy Awards, and her appearance as the first-ever black female stand-up to host ‘Saturday Night Live,’ Haddish’s long years trying to make it in Hollywood are paying off in a big way. We sat down with the comedian, actress, and all-around star entertainer to talk about her upbringing, her current projects, and everything in between. 1. You’ve always been hilarious, but Girls Trip made you a mainstream star. How did it feel to get such a positive reaction to your performance in that movie? The public response has been incredible. Since Girls Trip, I’ve gotten 16 new Instagram followers, 35 Facebook friend requests, and three responses to the Craigslist post I made trying to sell my old shoe rack. It’s a lot of fun, but all the attention can get a little overwhelming. Picking between three people who were all gunning for the same $10 used shoe rack from IKEA was one of the hardest decisions I’ve had to make since becoming famous. 2. You’ve been open about your difficult childhood, during which you spent time in and out of the foster care system. Has all the adversity you faced growing up influenced your newfound celebrity? Definitely. Because of my upbringing, I’m way more frugal about my money. No matter how many roles I land, the only money I allow myself to spend is the money I earn when I turn in criminals from the FBI’s most wanted list. Everything else goes in the bank. 3. You and Maya Rudolph were so funny at the Academy Awards that people have suggested you two should host. Are you interested? I love the idea of hosting the Oscars, but Billy Crystal and I are roommates, and I can tell he’d be really jealous if I did. After I got home from the Oscars this year, Billy came into our shared living room and told me that it was nice that I’d gotten to present an Academy Award, but that that didn’t make it okay for me to forget that I had promised to take out the trash. Over the next few days, I kept getting all these congratulatory calls about my hosting bit, and every time I picked up the phone Billy would stomp into the kitchen and start loudly unloading the dishwasher until I had to leave the apartment. Then, to top it all off, I had set our TiVo to record my performance at the Oscars, but Billy reset it to tape a rerun of Antiques Roadshow. So yes, it’d be a dream come true to host the Academy Awards, but I signed a two-year lease with Billy Crystal, and living with him would become a nightmare if I did it. 4. If you could do it all over again, what advice would you give to your younger self? When I was first starting out as a performer, the only head shots I had were the photos that they take during the big drop at the end of a roller coaster. Those helped me land a couple roller coaster–themed movies, but not much else. I’d probably tell myself to invest in better head shots. 5. You’ve talked about how you have already been able to achieve a lot of your career dreams, which is amazing. Is there anything you haven’t done yet that you’ve always wanted to do? I do really feel that I’m satisfied with everything I’ve achieved. But if I could get my true Hollywood dream, I would be in a movie that’s exactly the same as Girls Trip except 15 minutes longer, and those added 15 minutes would be made up of shots of my character walking to and from the bathroom in real time.